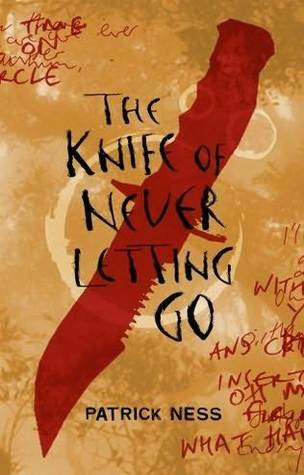 Review: The Knife of Never Letting Go - Book.Blog.Bake. This book frustrated me, but not necessarily in a bad way. It’s definitely a page-turner and has a really unique premise and great plot. I find Todd not exactly likable, but there’s no debating that he is a very well-written character. The writing in this book is a little hard to get into, since it’s written in Todd’s voice, who is fairly illiterate, meaning that certain words are misspelled and wording is sometimes strange, but it’s well-done. After the first thirty or forty pages, the writing stopped annoying me and I was able to focus on the story. In some ways, this book reminds me of Unwind in that Ness is not afraid to take on big topics like war, innocence, and the loss thereof. Even though on the surface this book is action and adventure-packed, at its core are some pretty big questions about morality. This is not really a book for the faint of heart(except I normally am), at times it’s rather gory, at least by my standards. The main issue I had with this book is the lack of information. For awhile, both Todd and the reader don’t know why it’s so important for him to run away from Prentisstown, and this reason is used to build suspense. That’s fine, for awhile. But by the time we actually got to the big reveal, I wasn’t full of suspense anymore, I was truly annoyed. I just found the information was withheld a little too long, and the book would have had just as much of an impact if that information had been revealed earlier. My other more minor complaint is more of a personal one. This book ends on a cliffhanger, but by the time I got to the end I was so emotionally exhausted from reading this book and slightly impatient with the pacing of information that I really don’t feel like reading through the rest of the trilogy, despite the fact that I really do believe this is a great book. As much as I want to know what happens, I don’t want to go on another journey with Todd again just to find out what happens in this world. Final Impression: This is no doubt a really well-done book, but I also found it incredibly frustrating at times. I want to find out what happens next, but I don’t care quite enough to run out and buy the rest of the trilogy right away. 4/5 stars. Top Ten Tuesday: Top Ten Books on my Spring TBR | Book.Blog.Bake. I have heard such good things about this trilogy, so I hope you’re able to continue with it! 4/5 stars overall is a really good rating. I haven’t read it yet mainly because I really dislike when books mess with language and wording and such. As you mentioned, I’ll probably get used to it as I continue, but things like that tend to throw me off at first. I hope that you’re able to continue reading (and enjoy) the rest of the trilogy at some point! The language and wording was really hard to get used to–it took me three days to read the first three chapters. I’m really glad I did, though. It’s a worthwhile read. I have heard the same complaint – the books is great, but I’ve got to take a break for one reason or another before tackling its sequels – from several readers and bloggers – myself included. I’ve read “The Knife of Never Letting Go” and the first 50 or so pages of “The Ask and the Answer” (because I HAD to know what happened next), but I had to put it aside because it is SO intense. I think they are wonderful, but I needed and still need a breather from the emotional turmoil. I’ve heard lots of other bloggers say the same. They are definitely on my TBR list to read, hopefully this year, but I wonder is this is a mark of a great series or a strike against it that it’s so emotionally exhausting the reader has to recoup before continuing. The thing is, I don’t know WHY it’s so emotionally exhausting. I mean, some pretty heavy themes are explored and some truly awful events go down, but objectively on the surface it shouldn’t be as emotionally draining as some other reading. The Hunger Games was pretty emotionally wearing for me, but I still read all three books and two days, and I didn’t feel quite the level of exhaustion when I was done. If I was an author I’d definitely be proud that I could provoke such strong responses from people, but as a reader I appreciate it a little less.